What is a Lottery Agent? How Do Lottery Agents Work? In a nutshell, online lottery agents act as bridges between you and official lotteries. 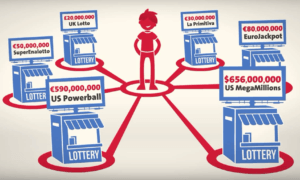 Lottery agents are middlemen who purchase lottery tickets on your behalf. They perform a simple task that powers most online lottery sites and enables you to participate in international games, like Powerball, Megamillions, EuroMillions, Lotto Max, to name a few. Exactly, how do they work? Why is it important to receive a scan of your tickets? Why is there a price increase? Are lottery agents safe to transact with? Why are lottery agents the better choice versus a betting website? Lottery agents usually have numerous offices scattered all over the globe. They can quickly go out and buy the actual lottery tickets on your behalf. For example, if you buy a ticket for Spain’s La Primitiva lottery, one of the lottery site’s agents in that area will purchase the ticket for you. Si! Someone will hop on the EMT, buhos (for you night owls that need a ticket after midnight), autobus or their Vespa and bring you one step closer to your winning ticket! Most will then scan the tickets, send a copy to your account, and keep the original for safekeeping. When you do need the original tickets, most lottery agents will be more than happy to give it you—while some will offer to claim the prize for you. Why Scan Your Lottery Tickets? Ticket scanning provides another layer of security as it assures you that your entry into each lottery game is legitimate—and that the ticket is yours to begin with. Some lottery agents do not scan the tickets. So, you’ll have to trust them when they say they have your ticket and that you own it. Risky business! What if you won but the site claims you don’t own the ticket? Don’t get me wrong, I’m not saying it will happen—just that it can, simply because you don’t have a copy of the ticket. It’s important to note, however, that some sites have generally good payout records despite not scanning tickets. Still, lottery sites that offer scans are definitely the better option—just for that added peace of mind. Why Do Lottery Agents Cost More? Some lottery agents’ ticket prices are slightly more expensive because they need to cover the costs of purchasing the actual tickets, scanning them, and storing them for safekeeping. Generally, the price increase isn’t significant—just a few dollars or cents. You’re paying for the convenience the lottery agents offer and is worth the minimal “handling fees”. Then there are those that don’t increase ticket prices at all but make up for it by taking a percentage from your winnings—and that’s not taking into account the taxes that need to be paid to the government. My choice would be to pay the small “handling fees” because what’s a few added cents or dollars compared to hundreds, if not thousands, taken from your winnings? Most lottery agents are generally safe to deal with, but there are some that you might want to avoid. One example are lottery agents that pay your winnings in annuity and offer no other option. If you’re not careful and you accept their terms of service blindingly, don’t be surprised to see your winnings slowly drip-fed to your account over many months. In other words, you won’t get your prize as a lump sum, and they’ll hang on to the entire thing as long as they can. Speaking of blindly accepting a company’s terms of service, another trick that some shady lottery agents use is by giving freebies to distract you from reading the fine print. The next thing you know, you’re paying for a subscription you never opted to in the first place. Another trick they use to produce the same results is to lessen the information they provide, especially with regards to charges. If a company’s fine print doesn’t clarify important points, there’s a good chance they can find a loophole to use to their advantage. Despite the drawbacks—and the few bad eggs—online lottery agents are still the better choice between the two types of lottery sites in the industry, simply because they offer better value. Compared to lottery sites that simply allow you to bet on the outcome of lottery games, lottery agents are players’ gateways to official lotteries around the world. Sure, betting sites can offer prices that are comparable to the actual retail value of tickets, but the latter actually buys the tickets for you. Not only that, but because you are an official entrant, you are guaranteed to receive your prize. While betting sites take out insurance policies, paying hefty premium fees so they can actually pay winners, there are still some risks involved. Remember, you are dealing with a private company and not a government-run lottery. And while they can lower ticket prices, you are essentially taking on more risk when it comes to being paid your winnings. Is lotto agent raeal? Any fraud is there in gaming with lottery through lotto agent? Will they distribute the prize amount to the winners account with making any fraudnes? Can we trust on lotto agent, is it safe? Hi, Satyanseelan, are you asking about lottery agents in general, or the specific company, Lotto Agent? If it’s the latter, we’ve found Lotto Agent to be a trustworthy service. You can check out our Lotto Agent review for more details. Hope this helps. I didn’t win but it says to see lottery agent for high jackpot promotion. I tried to find moreminfo on google. No luck. Do I still have a chance to win if my tickets are scanned by an agent? Hi Jennifer, do you mean something like a second-chance game with your lottery ticket? That would depend on your lottery agent. I think most agents would have no problems giving you the ticket information you need to enter a second-chance game. Hope this helps!